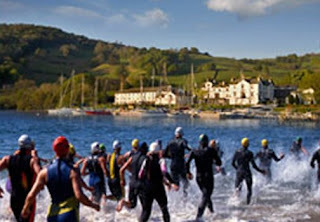 Our esteemed Sales & Marketing Director Clive Siddall – known for his Action Man exploits – took part in the inaugural Great North Swim on Saturday 13th September, when Lake Windermere - England's largest natural lake – was the perfect setting for the UK’s very first mass participation open water swim event. Over 1700 swimmers of all abilities including club and competitive participants, fun and charity swimmers took up the challenge of a specially designed one-mile course originally inspired by the BUPA Great North Run. The Great North Swim is the latest event to be launched as part of Take To The Streets – a national activity programme designed to fight spiralling inactivity and obesity rates and raise huge amounts of money for charity in the process. Team GB’s David Davies splashed to victory in the swim, ahead of Olympic rivals, Holland’s Maarten van der Weijden and Germany’s Thomas Lurz. In the women’s race, Cassie Patten and Keri-Anne Payne led the field. Sadly no photos seem to exist of Clive in his skin tight wetsuit - perhaps this is a good thing!